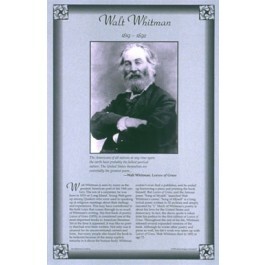 This unique educational poster features a photo of the great 19th century American poet Walt Whitman, as well as a quote from "Leaves of Grass," and concise biographical text summarizing his life and career. 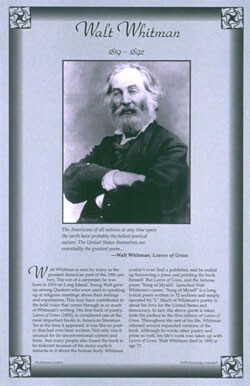 Walt Whitman has been called "America's poet." His first book of poetry "Leaves of Grass," was self-published and is today considered to be one of the most important books in American literature. This poster is a great way to introduce students to this important and influential American poet.